Accurate transmission of the genetic information requires complete duplication of the chromosomal DNA each cell division cycle. However, the idea that replication forks would form at origins of DNA replication and proceed without impairment to copy the chromosomes has proven naive. 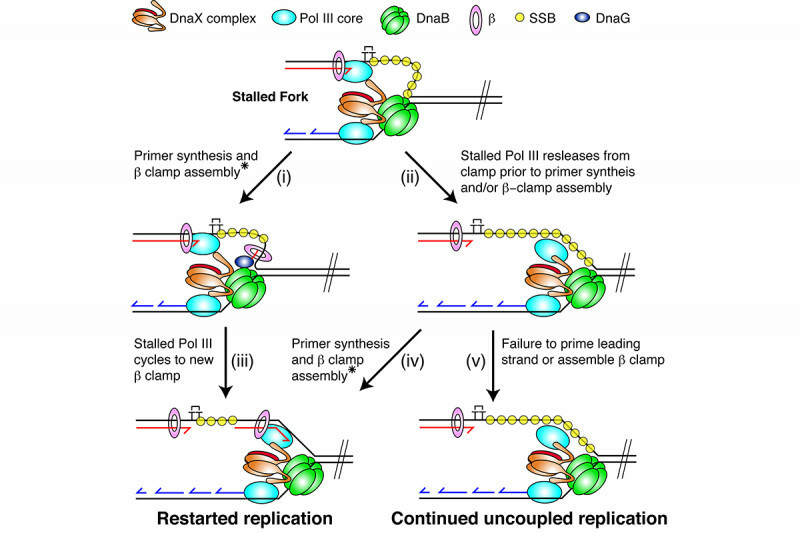 It is now clear that replication forks stall frequently as a result of encounters between the replication machinery and template damage, slow-moving or paused transcription complexes, unrelieved positive superhelical tension, covalent protein-DNA complexes, and as a result of cellular stress responses. These stalled forks are a major source of genome instability. The encounter of replisomes with damage in the leading- and lagging-strand templates have different consequences. As long as unwinding by the helicase is not impaired, damage in the lagging-strand template will not hamper replication fork progression in any significant way. 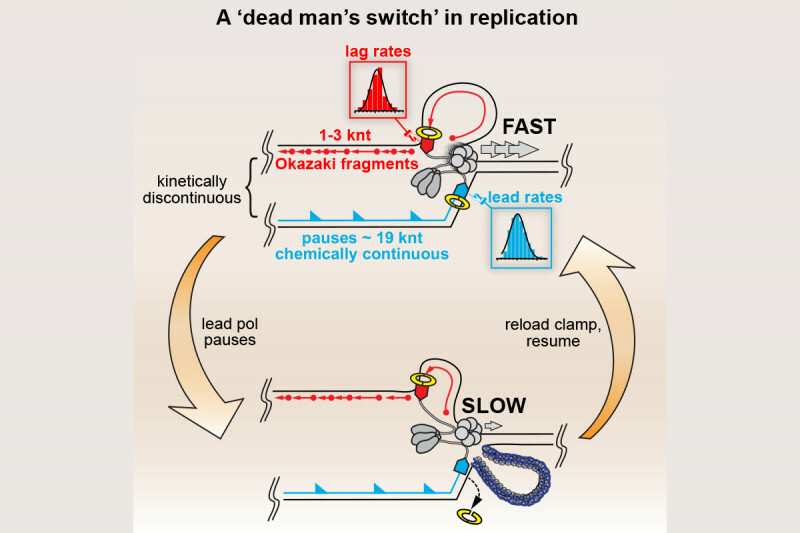 This is because replication on that strand is already geared to constantly initiate new Okazaki fragments. Thus, a lagging-strand polymerase that does become stalled at a template lesion will be able to cycle forward rather soon to the next primer synthesized. Therefore the net effect of lagging-strand template damage is that gaps are left behind in the nascent lagging strand that have template damage directly opposite the 3¢-end of the gap (similar to the case in Fig. 1e, although the gap shown there is in the nascent leading strand). Damage in the leading-strand template is more problematic (Fig. 1). When a replisome first stalls at leading-strand template damage, the situation drawn in Fig. 1a obtains. At this juncture the nascent lagging strand has not yet caught up with the stalled leading strand. There are many different pathways that can be operative once the replisome has stalled (Fig. 1). We have used replication systems reconstituted with purified E. coli replication proteins and DNA templates carrying a single, site-specific cyclopyrimidine dimer (CPD) to analyze the events that occur after the replisome stalls. A major finding was that the template damage was only a transitory block to replication fork progression. Template unwinding and lagging-strand synthesis continued at a reduced rate downstream of the damage, exposing the leading-strand template in single-stranded form. A subsequent de novo priming event on the leading-strand template allows the stalled leading-strand polymerase to cycle forward to the new primer terminus and coordinated replication then continues downstream (Fig. 1a to 1b to 1e and Fig. 2). Thus, the replisome bypasses the template damage in a reaction termed “lesion skipping” leaving a gap behind. These studies indicated that the replisome was therefore inherently DNA damage-tolerant. Another mechanism that contributes to DNA damage tolerance is direct bypass of template lesions by trans-lesion synthesis (TLS). In the past it was generally assumed that all TLS was accomplished by specialized DNA polymerases that could tolerate bulky lesions in the template at their active site and which switched with the stalled replicative polymerase (Fig. 1a to 1d). We showed that only DNA Polymerase IV (DinB) and not DNA Polymerase II, both of which are bypass polymerases, could associate with a stalled replisome to bypass a CPD. Recently we discovered another pathway of DNA damage tolerance, direct lesion bypass by the replicative polymerase in the replisome (Fig. 1a to 1c). We found that that the DNA Polymerase III holoenzyme, which is the replicative DNA polymerase in the replisome, (prepared from a strain deleted of the genes for all the TLS polymerases and with the proofreading exonuclease fully active) itself could bypass both a CPD and an abasic site analog (Fig. 4). TLS came at the expense of lesion-skipping replication restart. Thus, the stalled leading-strand polymerase was likely cycling between proofreading and polymerization at the 3¢-end of the nascent leading strand. Whereas polymerization across from the CPD will be slow compared to the normal chemical step, it was still faster than the amount of time required for progression of the DnaB helicase downstream and the synthesis of a new leading-strand primer to enable the lesion skip. Remarkably, bypass only occurred when the Pol III HE was integrated in the replisome. The enzyme itself could not bypass template damage in a primer-extension assay. These findings suggest that DNA damage at the replication fork can be replicated directly by the replisome without the need to activate error-prone pathways. Current projects in the lab focus on determining the signal for induction of the SOS response (the bacterial DNA damage response) after replication forks stall and on investigating the consequences of collisions between the replisome and the transcription machinery before and after DNA insult. Fig. 1. Pathways of lesion bypass and replication fork reactivation. (a) A replication fork progressing from right to left that has just been stalled by a leading-strand template lesion (the black triangle). Template strands are black, nascent leading strands are green, and nascent lagging strands are red. Direct TLS by the replisome (a to c). Polymerase switching from the replicative polymerase to a specialized TLS polymerase and back to the replicative polymerase (a to d). Functional uncoupling of leading-strand DNA synthesis from template unwinding and lagging-strand synthesis (a to b). Lesion skipping (b to e). Post-replicative template switching (e to f). Replication fork reversal (b to g). Template switching in a reversed fork (g to h). Fork reset, the reversed fork is restored to the original configuration of nascent and template strands (h to i). 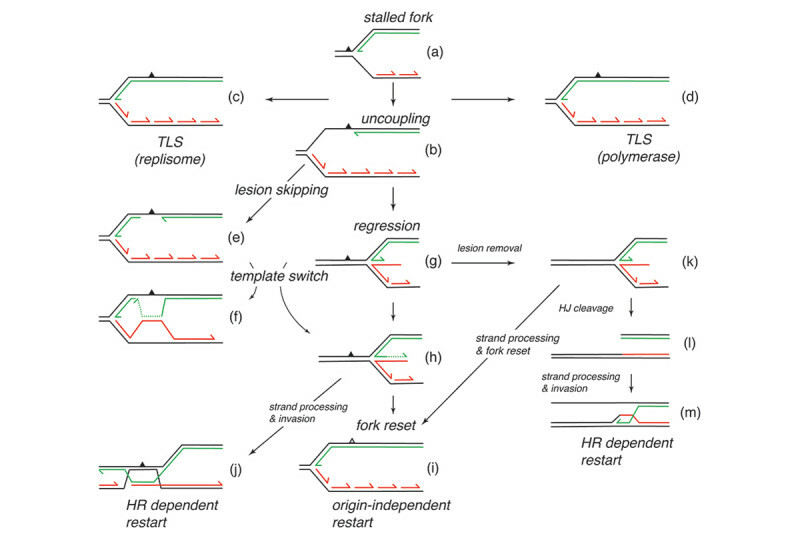 Homologous recombination-dependent replication restart for a reversed fork (h to j). Lesion removal by nucleotide excision repair at a reversed fork (g to k). Cleavage of a reversed fork by Holliday junction resolvases (k to l). Homologous recombination-dependent replication restart after Holliday junction cleavage (l to m). Note that the reversed fork in (k) can also be reset directly (k to i), with the grayed out damage triangle indicating that in this pathway, the template damage would have been removed prior to fork reset. Replication at the reset fork (i) can be restarted by origin-independent replisome loading activities. Fig. 2. Dynamics of leading-strand lesion-skipping by the replisome. Once the replisome is stalled by a leading-strand template lesion, progression of the leading-strand polymerase is transiently halted. However, the DnaB helicase and the lagging-strand polymerase continue downstream with unwinding occuring at a reduced rate (about 15% of normal) [(i) and (ii)]. As the leading-strand template is exposed it is coated with the single-stranded DNA-binding protein (SSB) and DnaG (the primase), which associates with the helicase, can synthesize a primer. The DnaX complex (which is part of the DNA Polymerase III Holoenzyme) can then load the β processivity clamp to the primer terminus. This, in turn, attracts the stalled leading-strand polymerase allowing it to cycle to the primer and resume DNA synthesis. The net result is that replication contiues unimpeded downstream of the lesion leaving a gap behind in the nascent leading strand [(i) to (iii)]. Failure to prime downstream of the lesion on the leading-strand template results in continued uncoupled replication [(ii) to (v)]. Fig. 3. The “Dead Man’s Switch” inherent to replication fork progression. Synthesis of both nascent strands is kinetically discontiuous, characterized by periods of DNA polymerization and pausing of the polymerases. After each pause or initiation of a new Okazaki fragment, the polymerases synthesize DNA at stochastically determined rates, both sampling from the same distribution of available rates. To avoid the accumulation of gaps duing a pause of the leading-strand polymerase, the helicase continues unwinding the template DNA at a reduced rate, allowing the leading-strand polymerase to catch up once it resumes DNA synthesis. This inherent property of the polymerases is the underlying basis for the uncoupled replication described in Fig. 2. Fig. 4. The replisome is capable of translesion DNA synthesis. The left part of the figure shows the template DNA used and the position of the template damage (UN, undamaged; THF, tetrahydrofuran abasic site analog; CPD, cyclopyrimidine dimer). Replication is initiated at oriC in the absence of any DNA topoisomerases. The counter-clockwise-moving fork is terminated at the Ter site. The clockwise-moving fork stalls after about 1 kbp of replication because of the accumulation of positive supercoils. The fork is then release by cutting the template with EcoRI. The clockwise-moving fork then encounters the template damage and the leading-strand polymerase stalls. The diagram on the bottom left shows the expected sister molecules after subsequent digestion of the products with PvuI. The right-hand panel shows a denaturing alkaline agarose gel of the products of replication on the various templates. 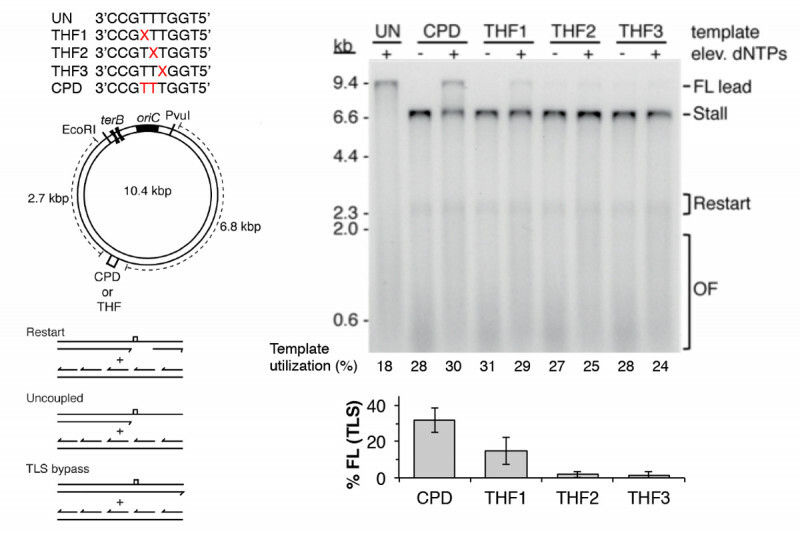 TLS bypass is observed as the production of full-length leading-strand DNA. The histogram on the bottom right shows the extent of bypass on the different templates.